www.xrtwo.com • View topic - This place still active? Post subject: Re: This place still active? But I'm not the Sunday or Summer driver sort of person. I'd rather drive it everyday than just on the two weeks a year we get when the sun comes out. I think there are a lot of forums at risk of death/stagnation, that thing with Photobucket switching off linked photos unless you forked out for the pro account has certainly been a factor. Facebook is the reason most forums have been nuked. The Photobucket one was just another nail in the coffin. Such a shame, lots of good communities and knowledge disappearing. Follow my racing on facebook! Every time I get access to a PC, I jump on here out of habit. Safe to say it's not very often! Location: W London. Drives: Mk2 Ghias. But my xr2 is off the road. The ghia will likely be coming off the road soon too needing inner wings. So we may have to get something else soon..
this place was at its peak in the early 2000's! was such a brilliant forum. As said Facebook etc killed it off. The advice offered on Facebook I've seen is often crap or wrong. Or crap AND wrong. I don't pretend to know it all. Some of the stuff I've read on Facebook makes me want to hit someone over the head with a cam shaft! 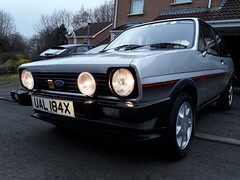 I'm still waiting to see a Mk1 USA spec fiesta on the road out here....... it's been seven years..... not seen one! KitKat - The Kat has spoken!! I went to the darkside and got myself a Vauxhall lol . Miss having a Fiesta . Still hold a massive place in my heart for them though ! Wow, just popped in to post a wanted ad, nearly got mowed down by tumbleweed. Dutton Phaeton S3, which I'm about to collect an ST170 as an engine donor for. So, yeah. Still playing with sh!t cars. This place seems to have been killed by Facebook. Which is a shame as all the groups I'm in on Facebook. No one seems to know sh!t about these cars. I read so much crap and inaccurate information that it makes by balls hurt.